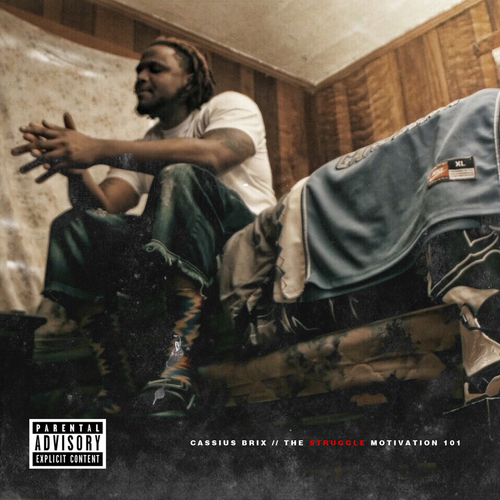 Fayetteville, TN rapper/songwriter, Cassius Brix releases his new album The Struggle Motivation 101 along with a fresh visual for the track "Streetz". Coming in at 23 tracks total, the project includes guest appearances from Tevin Revell, PaperChase, Balla Mac and Carey D.
Starting from the streets of his hometown Fayetteville, TN, Cassius Brix made a transition from the streets to music and gathered his peers to travel independent tours throughout local areas in Tennessee and striving to connect with Alabama, Georgia, California and New York City. Who said it's not possible to be street and book smart? The young brother represents the struggle for his people and friends locked up and dead. He motivates those to be proud of their environment and leading for example. He even dedicated a song to his favorite rapper Pimp C titled "R.I.P. Pimp C". Cassius Brix is young of age but ahead of his time and well experienced of street knowledge.